Finding an original example of a black dial 18k. solid gold OMEGA CONSTELLATION is becoming quite uncommon. This dial appears clean with the naked eye and really only a lacquer blemish visible near 3:00. This is an early 35mm. CONSTELLATION-dating to 1954. This dial is completely original with kite markers and Dauphine hands. I removed the crystal and photographed close-up to show the aging in the lacquer that can be seen under bright light an close-up. Truly, with the naked eye, this original dial looks good. The solid gold case looks very fine in person as well. The bezel nick appears MUCH less visible with the naked eye. The CONSTELLATION crown is completely correct. The crystal is generic. The solid 18k. gold case has NOT been over-polished…very nice. The caliber 354 automatic bumper winding OMEGA movement was meticulously (recently) cleaned and accurate. 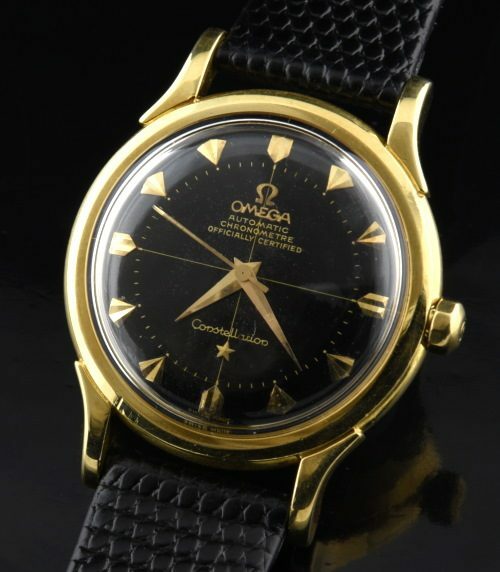 This is a very collectible and highly desirable vintage OMEGA. $4500.